To drive excitement and awareness around its new digital bus offering, Exterion Media are launching a photography competition across Twitter and Instagram. Spot, shoot and share your own photos for a chance of winning the latest GoPro HERO6 – just in time for Christmas! Share your images on Twitter and Instagram by tagging @ExterionMediaUK and #SPOTSHOOTSHARE. Competition closes midnight 17th December. We will be giving away GoPros for the best three images. Clear Channel are on the hunt for great street photography! Outdoor media owner Clear Channel has today announced the launch of My Town, the UK’s largest exhibition of street photography. The competition, which celebrates local towns and cities, showcases the work of photographers across the UK, and is free to enter. My Town encourages the public to snap photos of their town and submit them as a celebration of their local streets, and will see the best photos shared on social media and Clear Channel’s nationwide network of over 5,000 digital screens. In addition to national exposure, the winning entry will receive state-of-the-art camera equipment and a weekend city break. The competition, which will close on 29th September 2017, with winners announced in October, will be judged by world-class photographers including Dougie Wallace. Wallace is an award-winning British Street Photographer famed for his ‘Harrodsburg’ series, which won the Magnum Photographer Award in 2016. In addition, Wallace’s photos have been published in Dazed, GQ, The Guardian, New York Times and more, and he is internationally recognised for his long-term social documentary projects and distinct style of expressive street photography. The winner will be announced at Clear Channel’s annual Upfronts event in October. Justin Cochrane, CEO, Clear Channel UK said: “Outdoor advertising has a long and proud history of improving public spaces in towns and cities, both through the creative itself and through providing valuable infrastructure such as bus shelters, telephone kiosks, interactive area maps and free Wi-Fi. We’re launching My Town because we love cities, and the people who make them great. This will be the UK’s largest outdoor exhibition of street photography and a truly nationwide celebration of fantastic towns and cities right across the UK. Postimport http://ps-development.azurewebsites.net/wp-content/uploads/2017/09/Posterscope_Logo_White-2.png Postimport2017-08-07 14:55:332017-08-07 14:55:33Clear Channel are on the hunt for great street photography! Ocean has launched its 8th annual competition to discover the best creative ideas in DOOH, using innovative and emerging technology and techniques. Ocean’s Digital Creative Competition is now inviting submissions for bold new creative ideas which set new boundaries from brands, the creative community, agencies and charities. Entrants that truly raise the bar will win a share of a £650,000 prize fund and the chance for their creative concepts to be showcased across Ocean’s iconic UK DOOH locations, or via The Alliance network to Europe (Madrid), the USA, the Middle East (Dubai) and the Far East (Hong Kong or China). Announcing the 2017 awards, Ocean CEO Tim Bleakley said: “Ocean’s annual competition has consistently challenged creative thinking within the all screen market, consistently raising the bar for what is possible over the past eight years. Campaign, Primesight and Talenthouse are on the look-out for the next brilliant large-format creative with a campaign calling on creatives to dream up their “Ultimate Canvas”. The idea behind the campaign brief is to fuel a creative debate around what makes a great poster, exploring the importance of words, image, size, shape and composition. It also supports the breast cancer research charity Future Dreams. The Ultimate Canvas brief is open to everyone, whether that’s people working at agencies, freelancers, or creatives looking to break into the industry. The chosen design, selected by a panel of top industry creatives, will be announced on 14th July. It will appear on 10 of Primesight’s large format, digital poster sites across the UK, with a media value of £100,000. It will also be published in Campaign magazine and the designer receives £500. Finished artwork submissions can be entered here. The deadline is 1st July at 10:00 PT. Postimport http://ps-development.azurewebsites.net/wp-content/uploads/2017/09/Posterscope_Logo_White-2.png Postimport2016-06-16 10:07:362016-06-16 10:07:36Can You Dream up The Ultimate Canvas? JCDecaux has partnered with Virgin Media Business and Crowdfunder for Virgin Media Business’s #VOOM 2016 project, the UK’s biggest pitching competition for entrepreneurs and small businesses. #VOOM 2016 gives entrepreneurs and small and medium-sized businesses the opportunity to win a slice of a prize fund worth over £1million. An attempt to set a new Guinness World Records title for the Longest Business Pitch Marathon took place over 29 hours in London, from June 1 – 2. The final winners of the two categories – ‘Start-up’ and ‘Grow’ – will be announced on 28th June 2016. As the exclusive outdoor media partner, JCDecaux handled all the outdoor media activity for the #VOOM campaign, including a stream of the pitch marathon on Waterloo Motion (the biggest indoor screen in Europe). The outdoor media campaign has boosted entries to over 3,000 this year. JCDecaux will be offering all entrants mentoring support along with access to consumer insight and case studies following the competition. The #VOOM 2016 winners will receive a bespoke £250,000 Outdoor media campaign, as well as advertising on a JCDecaux premium site, Waterloo Motion. The winners from the ‘Start-up’ category will also be invited to enrol on JCDecaux’s exclusive start-up ‘Nurture’ programme, which works to scale start-ups (at all stages) by delivering fame and familiarity through outdoor advertising and mentoring programmes. The #VOOM 2016 entry and voting platform is powered by Crowdfunder, a proud partner of the JCDecaux Nurture programme, with entrants also able to raise funds by crowdfunding their VOOM business pitch. Currently, over £677,000 has been raised in crowdfunding for pitches. JCDecaux is on the judging panel for the Crowdfunder Five and the top crowdfunding business will be named Champion Crowdfunder 2016 – winning £50,000 cash, as well as a bespoke media campaign from JCDecaux. 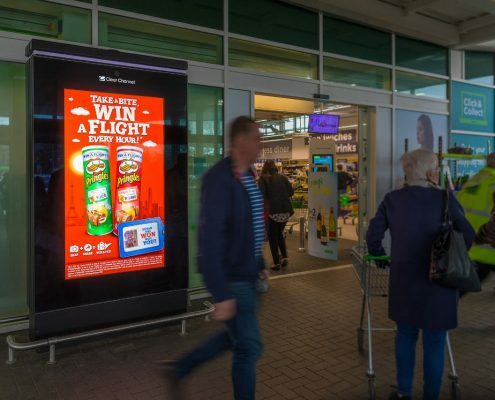 Primesight is launching a festive competition to celebrate the expansion of it’s network of digital roadside 48-sheets, which reaches 50 this week. ŠKODA, one of the oldest car manufactures based in the Czech Republic, wanted to gain national press coverage for the launch of the new ŠKODA Yeti. They achieved this by encasing a bright red Skoda Yeti in 10 tons of ice then placing it in Covent Garden, London and inviting the public to guess the combined weight of the car and ice in order to win it. Brand ambassadors and the Yeti costume character encouraged people to participate in the competition via iPads. Over 8,000 competition entries were received. Team Sandoz and their client Macmillan Cancer Support have been announced as winner of The Campaign CityLive Challenge – winning £50,000 of media space on MediaCo Outdoor’s CityLive touchscreen network in Manchester. Launched this summer by MediaCo Outdoor and Campaign Magazine, the challenge saw team leaders Andy Sandoz (Havas Work Club) and Malin Hanas (Razorfish) and their respective teams, battle it out on behalf of Macmillan Cancer Support and The Booth Centre Manchester. The brief was to create a campaign on MediaCo Outdoor’s interactive CityLive touchscreens in Manchester that would kick down any barriers to creative thinking in digital out-of-home. Macmillan Cancer Support’s winning campaign was all about getting local people to not just see Macmillan, but to do something positive with the brand. The campaign was based around a crowd-sourced running event between two CityLive units, using a networked solution through the cloud to link the screens to each other. Facial detection software was then used to recognise runners and then software to time them between two CityLive units. Runners could then interact with the event by uploading photographs of themselves using CityLive’s inbuilt cameras to share on social media and encourage donations to the charity. Team Hanas’ campaign for The Booth Centre was a very close runner up, using CityLive to change perceptions by storytelling in a data-driven and interactive way. It used real people at the Booth Centre who were filmed telling their own stories. This was loaded onto CityLive and inbuilt facial detection software was used as an automated content selector so that each of the stories was shown to the most appropriate audience. Viewers were invited to touch the hand of the person sharing their story in the film to trigger more information about the charity, their forthcoming Big Sleepout event and to donate. The winner was decided earlier this week by a judging panel of leading sector experts including Claire Beale, global editor-in-chief Campaign Magazine; Sue Unerman, chief strategy office MediaCom UK; Darren Bailes, executive creative director VCCP; Laura Jordan Bambach, D&AD president and creative partner Mr.President; Richard Blackburn, commercial director MediaCo Outdoor; Andrew Newman, founder Enigma and Martin Ayrton, managing director FTP Concepts. The Campaign CityLive Challenge has been supported by DOOH tech company FTP Concepts and DOOH creative specialists Enigma. Clarks’ in-house design group and Partners Andrews Aldridge have won top prizes in the Big Bus Challenge 2014 run by Exterion Media, in association with Campaign. The footwear retailer’s bus ad triumphed over other national campaigns while Partners Andrews Aldridge’s work for the Royal National Lifeboat Institution’s patrolling of the Thames emerged victorious in the regional category. Cogent Elliott picked up a media commendation for a campaign of simple line drawings for Samaritans. Clarks and the RNLI were awarded £200,000 of national and £25,000 of regional bus advertising respectively and each of the creative teams given £2,000 of department store vouchers to share. Samaritans was handed £20,000 of media space. The winning entries to the second Big Bus Challenge were chosen by a panel of judges and revealed at The London Transport Museum last night where guests were able to view showcased work. Clarks’ ad stood out for its “elegance, simplicity and having the courage to keep the design so minimal,” said Paul Domenet, the executive creative director of Johnny Fearless and a Big Bus Challenge judge. PAA’s EastEnders-inspired ad for the RNLI was praised as a “sound concept” by Andy Hunns, the creative director at Clinic and the Publicis executive director Andy Bird described Cogent Elliott’s Samaritans campaign as “brilliant, clever”, with “massive standout”. Four other national finalists were chosen: Cogent Elliott for WD-40; Rapp for the Open University; Lida for Foyles and Proximity London for The Economist. In the regional category, there were three finalists: Publicis Life Brands Resolute for The Passage charity; Rapp for Virgin Media and Bray Leino for Bath Spa University. The judging panel, chaired by Philip Smith, head of content solutions and studio at Campaign, consisted of: Martin Hancock, development director, National Express Bus; Gill Huber, group communications director, Posterscope; Chris Marjoram, managing director, Rapport; Richard Jacobs, marketing director, Kinetic; Ross Neil, executive creative director, WCRS; Jason Cotterrell, managing director UK, Exterion Media and Simon Harrington, marketing director, Exterion Media, along with Domenet, Hunns and Bird.